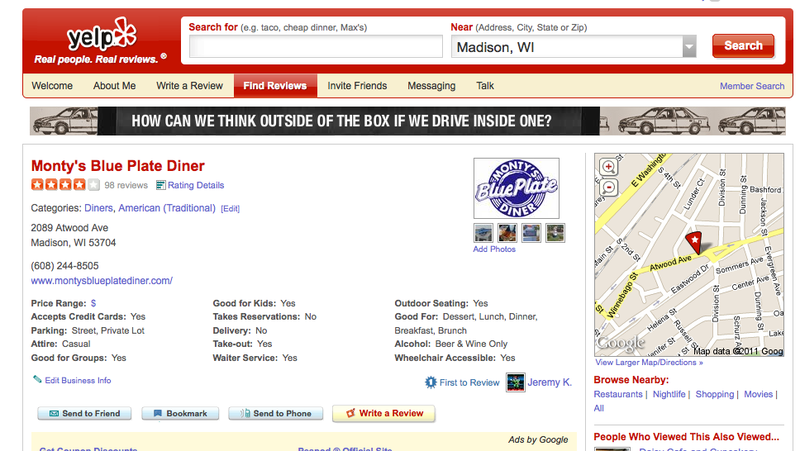 >Going along with my new restaurant reviewing Blog posts I decided to create a Yelp account. 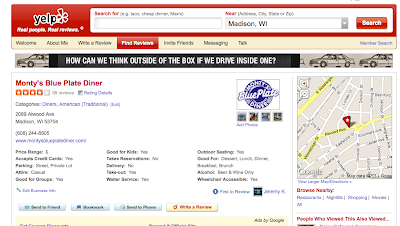 Yelp is this wonderful website that lets anyone create an account, and rate and review restaurants and other businesses. It is really easy to use and it is searchable by location, category or key words (like restaurant name). The site averages out all of the rankings and aggregates reviews for a main review of the restaurant and then lets users look at all of the individual rankings below. Reviewers can be as specific or general as they want because Yelp allows you to either write a review, use their ranking and question system, or do both! I have done three reviews and plan to do to keep adding to my profile of reviews because I just installed the Blackberry application that lets you look up reviews and enter reviews from your phone. On a restaurant’s main page it tells you everything from average rating, type of food, parking, price range, whether they take credit cards or reservations, and they even give you a little clickable map on the right side. I recommend using Yelp to find restaurants when you’re traveling and giving your favorite restaurant a boost in ratings! Creating an account is easy and looking up information is even easier! My most recent review only took a couple minutes!